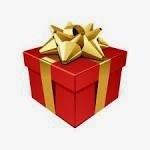 Last month, Shaadi.com had a Twitter contest. The CONTEST JUNKIE in me couldn't miss it! I went to the Airport on a HOT day and spotted the COOL Shaadi.com sign-board there and hopefully uploaded the pics for the 'Spot #Shaadi.com At The Airport' Contest! The prize was an IPAD Mini! And guess what? 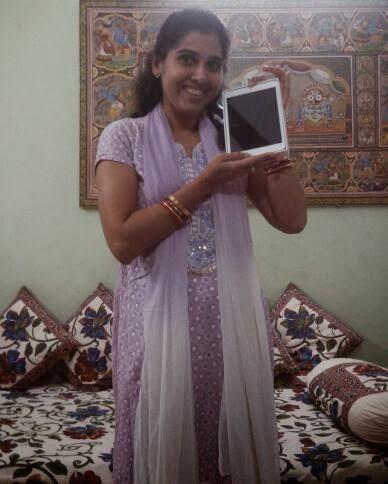 I won it thanks to Shaadi.com ! When the announcement was made on Twitter, I was travelling in a Bus, taking my Kid to a Video-Conference, scheduled to be held at the other end of the city. As she had qualified for a Literary Scholarship, my kid was to be interviewed by an esteemed panel that included Ruskin Bond and the Brand-Ambassador of Shaadi.com - Chetan Bhagat! I couldn't help but notice this! When I was declared a winner of this contest, I got many congratulatory messages through tweets! A BIG Thanks to all you lovely folks! I was smiling a lot and wanted to jump in joy, but didn't as I was travelling in the bus! My kid started constantly asking me, "Mamma, When will you get the IPAD?" She's the happiest and most eager as she loves gadgets! All the people who knew of my win, also enquired, "When will you get?" There are many people who never believe that such contests are for real! They ask me, with surprise written all over their face, "You mean Brands actually send the prizes?" Along with me, Aniruddha Pathak (@DanceEatRepeat), who needs no introduction to the Twitter Contest-World, was a winner of the same contest too! 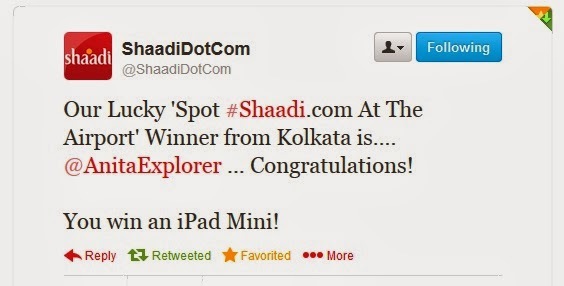 Team Shaadi.Com was constantly in touch with us giving updates about the prize! As I was in my home-town in Odisha for Durga Puja celebration, I had shared my Odisha address for prize-dispatch. We were happy and waiting eagerly hoping to get our IPAD soon! We were to send pics of it when we received! 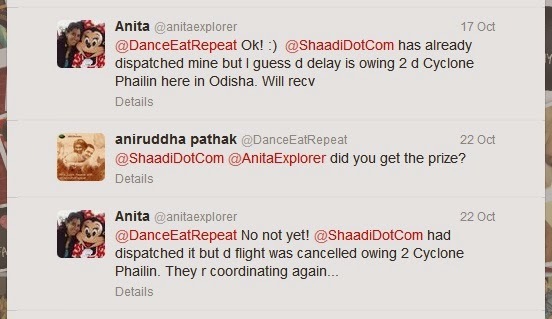 Team Shaadi.Com heeded to my request and shared the Courier tracking details too! But, even Aniruddha had not got his prize though there were no Cyclones in Mumbai! Eventually he received it a couple of days before I received mine! When I received my IPAD, I acknowledged it to Team Shaadi.Com! Team Shaadi.Com wants me to send the pics! Am sharing them right here, right now! 1. I am sharing this to honour Shaadi.com request for pics. 2. I added extra info to preserve this great experience in my Blog as I do not want these tweets to get lost in my Twitter TL! 3. This is not an advertisement or bragging about my win! 4. 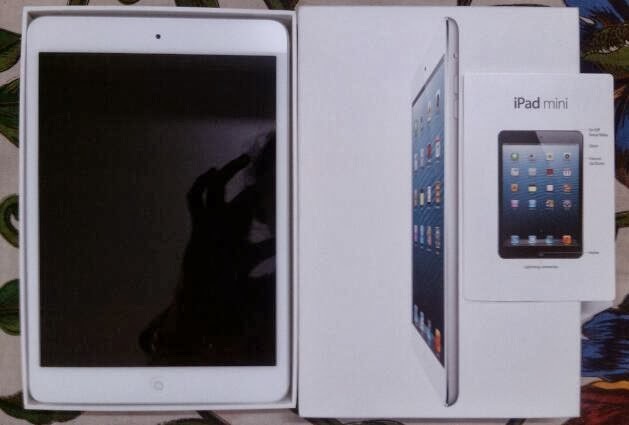 My IPAD is special as it's my first Apple product win, that too after YEARS of trying sincerely to win in contests, putting in loads of hard-work and spending time and resources, and yet not giving up hope! 5. All you non-believers, do note that some trusted Brands actually send the prizes!!! 6. All you believers, keep the hope and faith and keep trying sincerely! Simi was crying as her doll was broken. The King immediately understood the deep meaning. He knew his good times as a King won’t last long… Indeed, if a person is happy, he’ll be upset after realizing that happiness will pass away as it’s just a guest for a while! While if someone is sad, he will be happy that better times will come. After all, tough times don’t last, but tough people do!" Simi's Grandma ended the story. "So, did you see? Nothing lasts forever, dear! Why worry or cry over a broken doll?” , she asked Simi. Simi's Grandma had given Simi a lesson- a valuable gift for life. When close people like her parents and husband passed away, she maintained her composure. Simi knew- ‘Time is the greatest healer’ and all will be well soon. Many years later, Simi was a grand old lady. One fine day, Simi’s grand-daughter, Mini was playing with her doll, when it broke…Mini started howling! It was now Simi’s turn to share and "pass" on her Grandma’s Mantra! "This time our entry had to have one sentence that is repeated at least thrice in our post." 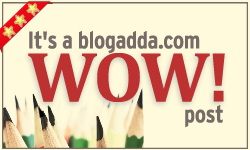 Proud that this Post won the WOW badge from BlogAdda along with other winning Posts HERE! 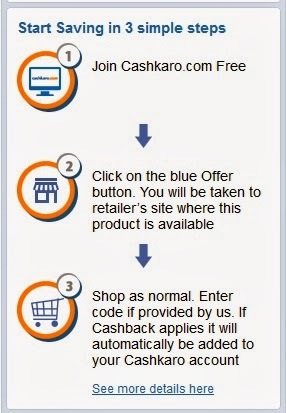 If I have Rs 10,000 that I get to spend using Cashkaro.com, I’ll happily shop & save & celebrate! More so now as I’ll get to save money too & win prizes this Diwali! Very easy to begin shopping & saving! 1. 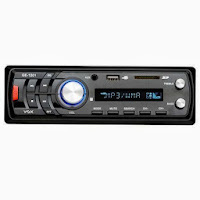 Car-Stereo for my Papa- My Papa’s present Car-Stereo’s CD system is not-functioning. He can no longer play all his nice song CDs collection. Long drives are no longer happy without music for company. 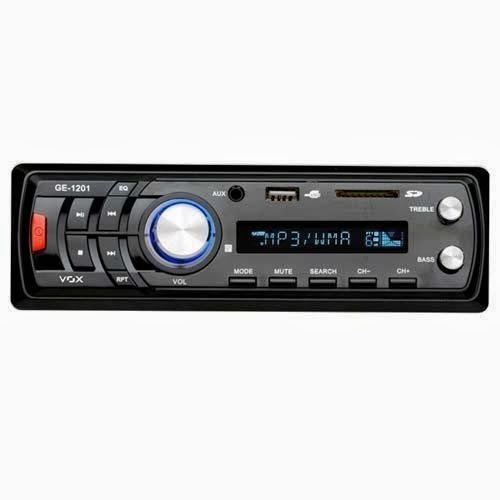 Toshiba brand m-600 Car-Stereo will be a great gift for my Papa this Diwali! 2. Marvel in Marble-22K-Gold Embossed Aarti Thali jewelled with Meenakari and Kundan work- This masterpiece will be a great gift for my Mom-In-Law who loves to pray for all of us…She will be happy to use it for the Diwali Lakshmi Pooja. 3. Movie-Subscription for my Family! We all love movies and this is a great Offer: Rs 50 FREE Cashback when I take Re 1 trial! 4. Vintage Plaid Shirt- a Casual Shirt for my Husband! He has many formal shirts, but comparatively lesser number of casual ones! This Long Sleeve - Soft Combed 100% Cotton should add to his collection! It will suit his personality and complexion! 5. 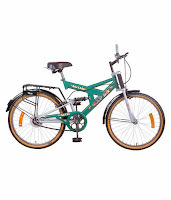 A Bicycle for my Kid- Avon Gypsy Bicycle – A Bicycle will make my kid get some much-needed-exercise and should be great for the evening-rides. It will make her physically fit as she will spend less time as a couch-potato watching cartoons on Television! Bicycle will be excellent for her health! 6. Dominos Pizza Party for my Friends and Neighbours – Lots of Pizza, Garlic Bread, Choco Lava Cake and more! Everyone loves parties and we all will have a great time for sure! This is 'Rishton Ka Time'- Time for Relationships! Dominos is expert for that! 7. With all the Cashback Savings thanks to CashKaro.com, Total Amount= Rs 1095.85, I’ll buy Rail-Tickets to travel home for Diwali! Celebrations are best enjoyed with loved ones! Some lose change that will be saved at the end will be invested in chocolates & confectionery that I’ll buy from the neigbourhood shop and distribute amongst my neighbours and known people like watchman, maid, newspaper-boy etc! I’ll spread the sweetness in this celebration time thanks to CashKaro.com !!! Spending Rs 10,000 at CashKaro.com is a smart idea! Apart from a wide range of products available at competitive costs, along with the comfort and convenience to shop from home, the additional incentive is that I get a chance to Win prizes worth 1 Lakh when I shop via Cashkaro now! With the amazing Diwali offer, the more I shop via Cashkaro within the Promotion Dates, the more I can win! Also, each time I shop with their sponsors, I get a chance to win Gift Vouchers! If you were given Rs.10,000 how would you spend it? How much would you save via Cashkaro.com and what will you do with that money saved? This is a Post for The Blog Karo & Win Karo Contest of Cashkaro.com.